According to a new report published by Transparency Market Research (TMR), the vendor landscape of the global patient warming devices is extremely competitive. Companies within the market are striving to add new products to their portfolio by forming strategic alliances with other companies. Companies are also extending partnerships and collaborations with other companies in order to expand their geographical reach. TMR recommends that players within the global patient warming devices could benefit considerably if they were to focus more on product differentiation. 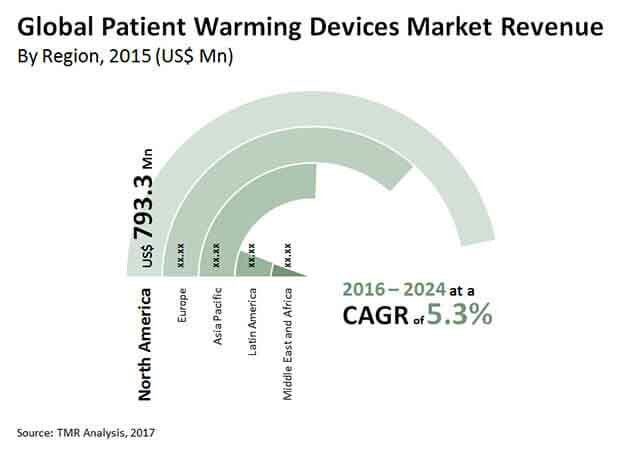 Leading players within the global patient warming devices market are 3M Health Care, Inspiration Healthcare (INDITHERM), C. R. Bard, Inc., ZOLL Medical Corporation, Smiths Medical, Medtronic plc, Stryker Corporation, GE Healthcare, and Philips Healthcare. According to TMR, the global patient warming devices market will be worth US$2.78 bn by the end of 2024. On the basis of geography, North America is expected to continue to lead in the market, followed by Europe. However, it is Asia Pacific which is estimated to exhibit the fastest CAGR during the forecast period. By product, it is expected that surface warming system will witness high demand. On the basis of application, acute care is gaining immense traction while the perioperative care segment is leading. As there is a rise in the incidence of illnesses and disorders which require surgical intervention that is often accompanied by hypothermia, it is anticipated that the perioperative care segment will witness a high-growth in the patient warming devices market. According to the lead author of this report, “the rising need for managing body temperature of patients who undergo surgical procedures which involves the use of anaesthesia is behind for patient warming devices.” As patients after a surgery experience a drastic drop in their body temperature on account of the use of anaesthesia, there is a requirement for patient warming devices. Also, the rise in the incidences of chronic diseases will favour the growth of the global patient warming devices market. In addition to this, the rising prevalence of cardiovascular conditions as well as oncological conditions will drive the demand for these devices for the as the usually leads to surgical interventions. Another important factor which is expected to fuel the demand for patient warming devices is the rising rate of premature births as well as the growing number of neonates. An increase in the number of geriatric population who are more vulnerable to various chronic disorders will also be a factor which is responsible for the growth of this market. An increasing incidence of musculoskeletal disorders on account of sedentary lifestyle and long hours spent in offices will also create a favourable environment for the growth of this market, said a TMR analyst. The report not only discusses the various factors boosting the growth of this market but also discusses the various factors which are expected to act as challenge. The implementation of patient warming devices can pose risk of serious side effects invasive nature. This is expected to discourage their use to some extent. The high excise duties imposed on patient warming devices will also pose a challenge.